Hello lovelies, we made it to Friday! This week's look is brought to you by the funky vibes of the 70's. There are so many trends going on in this look so let's get started. 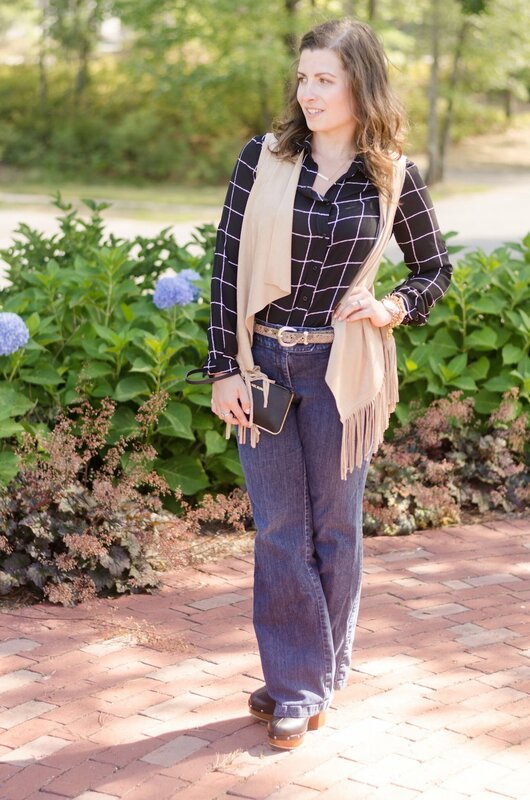 This look features a window pane blouse, faux suede fringe vest, trouser jeans, & clogs. Hi the 70's called & they hope you're enjoying this look. Window pane & fringe are still very prominent trends. This neutral colored vest gives this look some relief, not to mention suede & faux suede in many forms is huge right now for both fall & early spring. 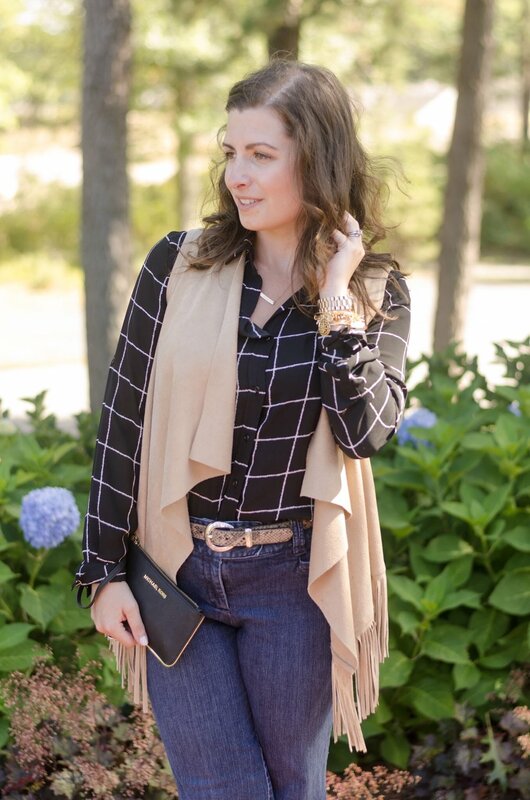 Although I am a sucker for a good skinny jean there has been a shift to bootcut & wide leg jeans, they are the best selling shapes in my catalog & have been seen everywhere. I topped this look of with clogs & a belt! Now I felt a little daring to throw all these trends into one look but, you don't have to! Maybe you only pair a couple of these trends together. 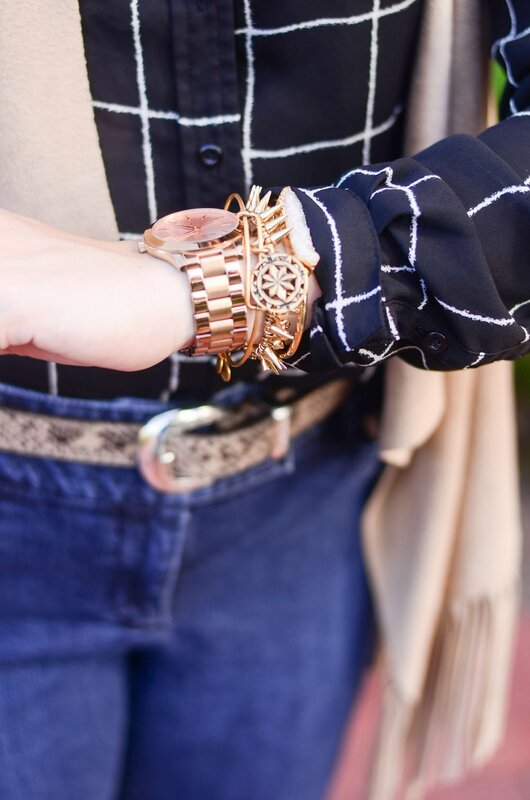 Like fringe & wide leg jeans or window pane & faux suede, the possibilities are endless. In fashion there used to be these unwritten rules like don't wear white after Labor Day. Well these unwritten rules are a thing of the past. As long as you love your look & can rock it confidently, go for it!